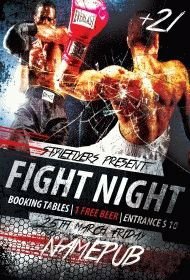 We decided to add to our sport flyers category one more listing– premium boxing flyers templates. 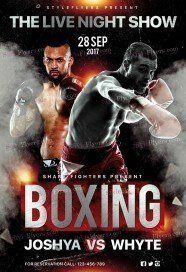 Here you can find a great amount of high quality Photoshop files, which will help you to hold your boxing event. Here each client will can buy boxing flyer template to his liking. We tried to bring all our printable samples to perfection, but if you think that we have missed something or we add some unnecessary detail, you can customize any flyer after purchasing. 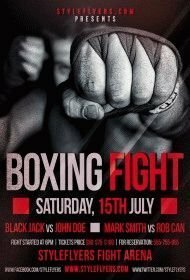 Buy boxing flyer PSD templates and your online promotion will become easier. We will help you to steal the show. All premium boxing flyers have a unique and bright design. And Facebook cover. Each detail is a part of thoughtful design. We try to convey the ambience of the box, and create the inspiring design. 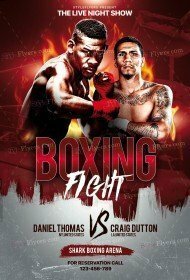 Buy any of our premium boxing flyers at fixed price – just $2.49. You can also subscribe and save your money. In this case you will get an unlimited access to all premium flyers for sale. If you want to make an exclusive boxing flyer, you can hire our designers and they will create a product, which will satisfy your needs. Just contact and make your order right now!